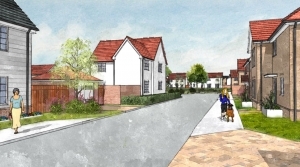 Phase 2 of the development at Star Lane, Great Wakering maintains the vision of the original master plan in creating high quality residential properties, whilst following the principles of the submitted Design Code for the site. Within the site are the Character areas; the Street, the Lanes and Village Green, which aim to offer a sense of place. 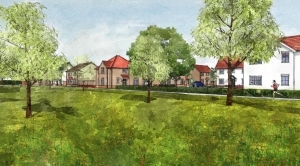 These are small groups to create continuity through the site whilst still offering enough variety to make Star Lane a unique and enticing place to live. The Village Green overlooks the main Public Open Space running centrally though the site. The traditional design has a mixture of two to five bed houses and one to two bed apartments arranged across the site. The majority of the development building heights range between one to two storeys in height. The introduction of two and a half storey houses have been utilised as key elements within the street scene which is highlighted in the Design Code framework plans. The scale of the development reflects the broad transition in character from the existing properties to the north and south-west. The scheme will provide a variety of residential properties, in terms of type, scale and design, with a range of unit sizes, catering for all sectors of the local community.